The clock chimes at Portsmouth Cathedral have been silent and the tower clad in vinyl wrapping since July 2015, while vital restoration work is undertaken to repair the structure. 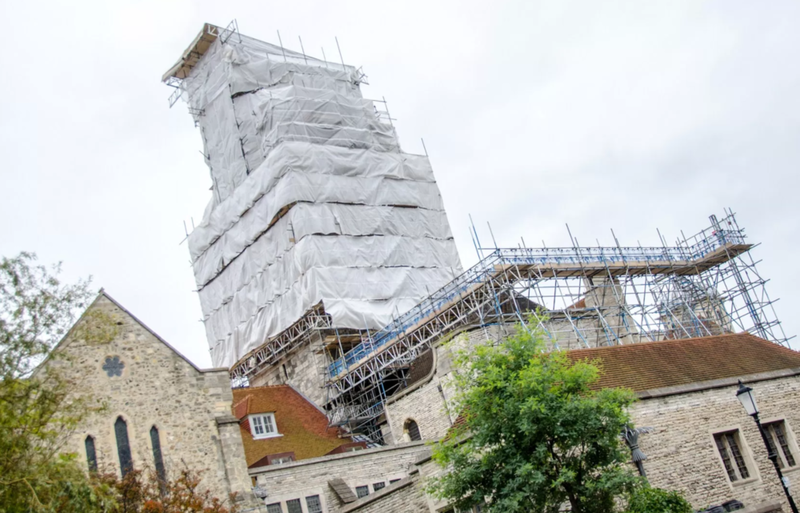 On Monday 23rd May, a significant milestone will take place, hailing the near-completion of the works: the Golden Barque will be restored to its rightful spot atop Portsmouth Cathedral’s tower. Visitors and residents alike in Portsmouth will have observed the building works over the past year at the cathedral, where a restoration team from Daedalus Conservation has been working on the 17th century tower and 12th century east walls of the cathedral. Restoration of the tower and walls of Portsmouth Cathedral has been made possible through a grant from the First World War Centenary Cathedral Repair Fund. Both the city’s cathedrals, Portsmouth Cathedral of St. Thomas of Canterbury and St. John’s Roman Catholic Cathedral, were amongst those which received grants thanks to the government-sponsored fund. The fund was established in 2014 to support vital repairs to some of England’s most important historic buildings, in special recognition of the role of cathedrals in Britain’s shared history. In special commemoration of the centenary of the First World War, two commemorative rain rain hoppers were installed earlier this year on the tower, inscribed with the dates ‘1914’ and ‘2014’. The beautiful gilded ship at the top of the tower, the ‘Golden Barque’, was added in 1710 to the cupola where it has acted as a weathervane and as a welcome landmark for homecoming ships. Portsmouth lore holds that whenever the barque was taken down for cleaning, local mothers would place their babies in it believing this would prevent death from drowning. Restoration and conservation work on the tower and cupola — the domed piece of architecture atop the tower — has been ongoing since July 2015. The original Golden Barque was blown down in a gale in 1954, and is now mounted on an oak plinth in the cathedral’s nave, constructed from timbers recovered from HMS Victory, Admiral Lord Nelson’s flagship in the Battle of Trafalgar. The last major restoration of the Golden Barque was completed in 1969 by lifelong Portsmouth resident Reg Morris. Reg, born in Staunton Street in 1923, was trained as a plumber at the age of 14 and first worked for Fookes & Son. During World War II, Reg was called up for service in the Royal Navy, spending most of his wartime service in the Portsmouth dockyards working on Monitor class ships used during the war as depot vessels. In 1950, Reg joined local firm Gardiners and continued his work as a plumber where he would later establish a close connection to the barque and Portsmouth Cathedral. In 1969, the cathedral cupola underwent some repairs and repainting. It was during this time that the weather vane was found to be jammed, and the Golden Barque in need of repairs. Reg was nicknamed ‘Mr. Cathedral’ by a verger because he spent so much time carrying out repairs in the cathedral, and restored the barque for several more decades of service. He retired from plumbing in 2001, at the age of 79. While the precise time of day for the barque’s emplacement is pending, the operation is expected to take approximately two hours, pending weather conditions. With the scaffolding to be removed around the top of the tower, the work should be easily visible to any hopeful viewers able to find a vantage point around Old Portsmouth. The pictures below are shots we took of Portsmouth Cathedral before and during the renovation work.